Patch 5.4 is here, and those that aren't gallivanting around the Timeless Isle have likely already taken their first steps into the Siege of Orgrimmar. The boss fights are exciting enough on their own, not to mention the awesome loot waiting to be found in the depths of the newest raid. But what many players don't think so much about is the raid itself. I'm not talking about the bosses or the mechanics of the encounter, but the actual bits and pieces that make up the space in which we're destroying all those new bad guys. We've had plenty of developer interviews leading up to patch 5.4, but Blizzard was kind enough to give us an interview of a different sort. 3D artist Fanny Vergne-Vicente is one of the many artists at Blizzard that helped put together the Siege of Orgrimmar raid from the ground up, designing textures for everything you'll see while you're merrily murdering Garrosh -- the walls, floors, spikes, and everything else that makes the encounter come to life. We had a brief chat with Fanny about just what a 3D artist at Blizzard does, and what it was like bringing the Siege of Orgrimmar to life. WoW Insider: First things first, because I'm sure there are plenty of curious people out there – can you give us a brief description of what you do as a 3D artist, and how you do it? Fanny: As a 3D artist, my job is to conceptualize and bring environments to life. For World of Warcraft, I have the opportunity to create everything for the environments I work on, including the models and textures. I generally start by creating a 3D block-out in 3ds Max. Then I paint over it in Adobe Photoshop to give me a better idea of which direction I will take for the scene's ambience and details. After that process, I go back to 3ds Max to recreate what I did in Photoshop. When everything is modeled, I start creating textures with Zbrush and Photoshop and then apply them to my models. For Patch 5.4, I specifically worked on the texturing for the Siege of Orgrimmar raid. The modeling part was done by another artist, Jonathan Jacobson. What are some of the factors you have to take into consideration when creating new art assets for the game? Every time I create a new art asset or texture, I try to keep in mind the overall World of Warcraft art direction and style. World of Warcraft's art style is very colorful with strong silhouettes, and the textures have to keep a hand-painted feel. All of us on the World of Warcraft art team do our best to maintain a consistent approach when creating assets for the game. I also have to consider the technical constraints when I create something. For example, when I model a piece of art, I have to think about the total number of polygons, the resolution, and eventually how the piece will be used in the overall world. Patch 5.4 has a lot of new areas and environments we haven't seen before. Does the rest of Pandaria's overall design factor into how you create new raid environments? Absolutely! The entire art team works very closely with the level designers so that the raid itself has a consistent feel and look. This is very important to us, as we want players to not only remember the battles themselves but enjoy the atmosphere they adventure in. How do you take a well-known, populated area like Orgrimmar and create something new and visually interesting out of it? Orgrimmar is notoriously red on red on red. This was both a great opportunity and fun challenge for everyone. For me specifically, I worked on the last zone environments for the Siege of Orgrimmar, which is under the city as well as a new zone. For the ending zone within the Siege of Orgrimmar, we tried to represent best as we could the orc culture. It's a very aggressive culture that uses primarily metal and wood to create their buildings and structures. They use a lot of dangerous things like chains, spikes, horns, and lava, and we tried to respect those considerations. So, we wanted to give a very different feeling than the rest of Pandaria, which is very peaceful, when compared to the aggressiveness of Garrosh. We also tried to create a feeling of discomfort and suffocation by adding elements like ovens, coals, lava, and smoke to show the dangers of this part of the raid. What were some of the challenges of creating art for 5.4? What was the most difficult thing you had to work on? Creating textures for the Siege of Orgrimmar was my first major task at Blizzard. I had to adapt to a new team that had a very efficient process while trying to adapt my art style to the World of Warcraft art style. It has been an amazing and sometimes crazy time. 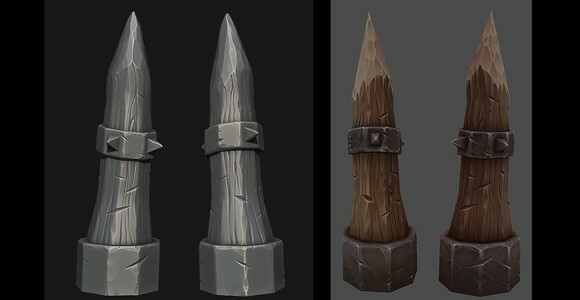 My biggest challenge was to create textures with Zbrush, a digital sculpting program, and adapt this process for stylized textures that fit with the rest of the game. I'm glad to have this adapted process because it gives me a lot of useful lighting information to paint over in Photoshop. What would you consider the best work in 5.4 – the most interesting to work on, and the most interesting we'll see as players? I like the fact that the raid is very huge and designed with three very different parts. This way, players will enjoy the variety of multiple environments while gradually delving into Garrosh's madness. Is there anything specifically that we can watch for and say "Oh hey! Fanny made that!" I hope all the players will like the textures for the last part of the raid, and I can't wait to hear their stories of defeating Garrosh! Thanks for taking the time to chat with us, Fanny -- we'll keep an eye out for your work!